Home > Gas > Empty Property: Should I Pay Supply Charge? Landlords' responsibilities for utility charges on empty properties are something of a grey area. The situation varies according to the utility in question, the company supplying the property, the contract(s) that were in place with the tenants and what happened when the tenants vacated the property. Let's take the best case scenario first. In an ideal world a tenant will let the supply company know when they are going and leave a forwarding address. When they leave the liability for any charges after that will pass to the landlord, and when a new tenant arrives they will take up a new contract with the existing supplier or a new one. This means the landlord will be paying charges accrued during the void period, but of course if the utilities are barely used then those charges will be very low. The alternative is to terminate the contract and allow the supply to be cut off. This probably makes sense for a telephone service, but not for a gas or electricity supply. Telephone accounts can be closed and when the new tenants move in they should easily be able to start up a contract with a new telephone supplier. As the line will still be in place the reconnection should be quick and the charges low. Gas and electricity supplies are a bit different. 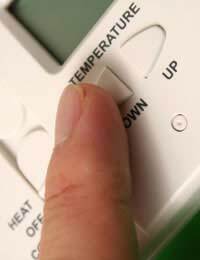 Apart from the fact that it is considered acceptable for tenants to set up their own telephone supply, it is not acceptable to provide a rental property without electricity and gas (or whichever form of heating is used). Cutting off and reconnecting a supply usually entails a visit to the property by qualified engineers so suppliers may levy charges for disconnecting and reconnecting. It would be difficult to get tenants who would accept paying those charges. If you find yourself with bills coming in from a utility supply company who had a contract with the departed tenant the liabilities may end up with you. Although the tenant has gone, under certain circumstances the utility supplier may consider that a 'deemed contract' is in place and you will be picking up the tab. If a property is vacated the landlord should get in contact with all the utility suppliers and inform that the tenants have moved on, with their new addresses if possible. The utility companies may then make standing charges for maintaining the supply, even if there is no usage. This is down to the individual contract with each supplier, some may do this and others may not. But if you find that tenants have left without sorting this out and you are being hit for supply charges, it's unlikely that you can do anything about it. If you think the situation is unfair, you need to get legal advice. To be honest, with gas and electricity you are probably better off leaving the supplies connected in any case, particularly if you want to find a suitable tenant as soon as possible. Finding that tenant will be much more likely if the house is lit and heated, and in winter it will pay to have the heating on to avoid any frozen and burst pipes. Getting rental income coming in faster will outweigh any small charges for gas and electricity charges on an empty property. Have a rental property that caught fire on July 2018. Uninhabitable, all utility meters switched off and were damaged in the fire. Got SSE chasing me up for outstanding bills(dunno how they got my details). Called them and they advised that they took over the utilities in Sept 2018, I advised about the fire in July 2018. So how can I owe them anything since everything switched off, and no-one living there? They wont even deal with me unless I advise account number, which I know nothing about, since it was not me that opened the account! Hi, our company is a Limited company and we rented a property for 1 year in 2006-2007. The gas was never used and was disconnected in 2007 while we were in the property but the meter was not removed. Having not been in the property since 2007 we recently began having issues with credit accounts due to 'exceeding payment terms by 150 days' which we knew was not the case. Following an investigation a couple of months ago with Expedia it was found to be an issue with BG and on contacting BG we were informed we would need to pay a standing charge for the past 11 years. We have received no communication in the interim period. What rights do we have? Should the landlord be liable for this period or can it simply be argued with BG that the standing charge should be dropped and the meter should have been removed? At the moment, BG have simply attended the property, confirmed the meter is still in position and say the standing charge is still owed. Hi, I works at a small community Library run by a charity. Over the summer Balfour Beatty conducted roadworks and disconnected our gas supply, but never reconnected it. We only realised this when we came to turn the heating on last week. Are we still obliged to pay British gas for the Standing charge during this period? I have an annexe which has been occupied by my son for several years. He moved out recently and I have had the gas meter disconnected. I have no intention of renting out or using for family use. Why do I have to pay a service charge? Is my only option to pay to have the meter removed? Unfortunately, removal is your only option if you do not want to pay a service charge. Different companies charge different amounts for removal as well as this has not been standardised either. I have an annexe which has been occupied by my son for several years.He moved out recently and I have had the gas meter disconnected.I have no intention of renting out or using for family use.Why do I have to pay a service charge?Is my only option to pay to have the meter removed? I am joint owner of several properties with my ex husband. He says the properties have been empty and unoccupied since our divorce ten years ago. How can I find out if the utilities have been used during that period ie if there have been tenants that have had utilities connected for use? And am I legally entitled as a joint owner to obtain this information? I do not need details of the occupiers or details of their consumption, just to know whether the properties have been leased to tenants during the ten year period. My dad died last July and his house has been unoccupied since then.I've been trying so far unsuccessfully to sell it.Recently I received a bill from British Gas for £176 -in spite of the fact that the house is unoccupied and the gas (central heating ) hasn't been used!-when I rang them they said it was standing charges but the customer service adviser also said I wasn't "personally liable" because the account was in my dad's name not mine and I was the executor.Is this true?-they also sent me a letter threatening g debt collectors.Is there a way I can get out of paying this ?-it seems ridiculous to have to pay this. @smileymiles. Many companies do continue with a standing charge on an empty property. You should send a copy of the death certificate and request a breakdown of all costs, credits and debits from them, to help you verify whether amount charged is correct. I sympathise with this being in the same position. My gas meter has now been removed from the empty property - no gas used- but standing charges in my name. They had the wrong name at first - now corrected and are seeking to charge my own property where I have no outstanding bills. My tenants left owing nothing but a new account was set up without my consent and charges began. change your telephone number , it will cost them a lot more if they take you to court. I had 2 peeps chasing for my sons debts, I pay off a bit but leftapprox £300 outstanding now they have left me alone. I am in the middle of a dispute with Eon over a bill for £95.00, if anyone has "taken them on" then please give me some advice, remember its only £95 so the value of my time verses the "big boys bulling" may become an issue. I have an investment flat which was let long term, the tenants finally left 5 months after their tenancy expired, under a cloud and owing rent. I live 400 miles from the property so once all the rubbish left inside the flat was removed and all the paintwork repainted, put it in the hands of a local agent who let it and now manages it for me. Eon sent a number of bills during the 8 week void period, I called them a number of time explaining the property was empty so the "estimated readings" where wrong and the agent would inform them of the new tenants when they go in. Alas the old tenants had given a meter reading 400 units lower than it actually was so the unfurnished empty flat showed a usage (not even an appliance so not the fridge as Eon have suggested). I have spent several months explaining what happened, Eon have now used a dept company which calls me daily to demand payment each time I explain the position, I have even complained to both company's that they are harassing me which is an offence, they log my complaints and call the next day with more threats and as for the post you would think i was a criminal. Has anyone got any ideas to help or should I just let the bullies win and move closer to the campaign of rip of Briton or are Eon French?